According to Statistics Finland's preliminary data, prices of old dwellings in housing companies remained unchanged in the whole country in the fourth quarter of 2017 compared with the previous quarter. 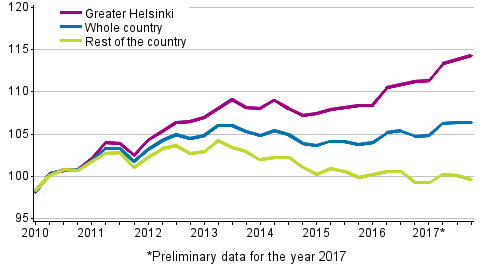 In Greater Helsinki, prices went up by 0.4 per cent, while in the rest of the country prices went down by 0.5 per cent. Compared with the corresponding period of 2016, prices rose by 1.5 per cent in the whole country. In Greater Helsinki, prices went up by 2.8 per cent and in the rest of the country by 0.4 per cent. In October to December, the average price per square metre of an old dwelling in a housing company was EUR 2,336 in the whole country, EUR 3,767 in Greater Helsinki and EUR 1,695 elsewhere in the country. Prices of new dwellings in blocks of flats and terraced houses fell by 0.8 per cent in the whole country compared with the previous quarter. In Greater Helsinki, prices went down by 1.5 per cent and in the rest of the country by 0.5 per cent. Compared with the same period in 2016, prices of new units in housing companies rose by 1.4 per cent in the whole country. In Greater Helsinki, prices went down by 1.0 per cent, whereas in the rest of Finland they rose by 2.8 per cent. The average price per square metre of new units in housing companies was EUR 3,599 in the whole country, EUR 4,643 in Greater Helsinki and EUR 3,231 in the rest of the country. According to preliminary data, prices of old dwellings in blocks of flats and terraced houses went up by 1.1 per cent from the previous year in the whole of 2017. In Greater Helsinki, prices went up by 2.7 per cent, while in the rest of Finland they went down by 0.3 per cent. In 2017, the average price per square metre was EUR 2,341 in the whole country, EUR 3,753 in Greater Helsinki and EUR 1,708 elsewhere in Finland. Final data on the prices of old dwellings in 2017 will be published on 2 May 2018. In 2017, prices of new dwellings in blocks of flats and terraced houses went up by 3.9 per cent in the whole country. 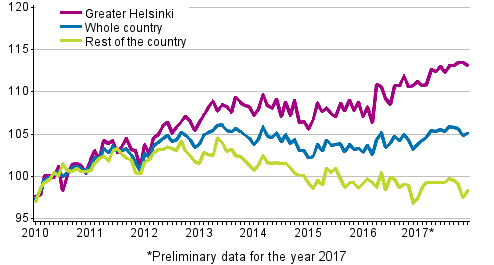 In Greater Helsinki, prices went up by 5.0 per cent and in the rest of the country by 3.4 per cent compared with the previous year. In the whole country, the average price of a new dwelling was EUR 3,658, in Greater Helsinki EUR 4,854 and elsewhere in Finland EUR 3,236. According to Statistics Finland’s preliminary data, prices of old dwellings in blocks of flats and terraced houses went up by 0.3 per cent from November to December in the whole country. In Greater Helsinki, prices went down by 0.3 per cent and in the rest of the country they rose by 0.9 per cent. Compared with December 2016, prices rose by 1.9 per cent in the whole country. In Greater Helsinki, prices went up by 2.2 per cent and in the rest of the country by 1.6 per cent. In December 2017, the average price per square metre of an old dwelling in a housing company was EUR 2,299 in the whole country, EUR 3,697 in Greater Helsinki and EUR 1,673 elsewhere in the country. When the monthly statistics on prices of dwellings in housing companies are published they cover approximately 50 per cent of all transactions made in the latest statistical month. The monthly data become revised during the following months so that the final data for the year are published in the release concerning the first quarter of the following year. For further information about data revisions, see separate tables. ISSN=2323-8801. December 2017. Helsinki: Statistics Finland [referred: 25.4.2019].